Diabetes is a growing epidemic among dogs, and unfortunately, an uncurable one. By recognizing the early symptoms of diabetes, you can prevent further symptoms and create a better life for your dog. Though your dog may seem hungrier than ever when showing signs of diabetes, he'll suddenly begin to lose weight. This has to do with the fact that, without insulin, a diabetic dog can't absorb glucose into his cells. When this happens, normal metabolism is accelerated and the body will look for other energy sources. This means that the body will begin to consume your dog's fat and protein. 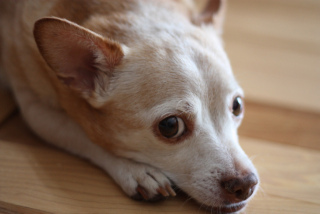 When cells in a dog's body aren't receiving enough glucose, he will begin to lose energy. This is because glucose is a source of energy. Diabetes can also cause back muscles to waste away, and weakness in the legs and feet. 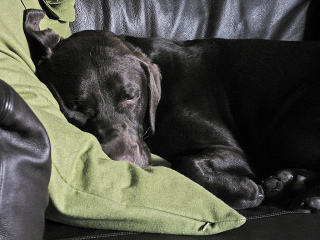 If your dog seems abnormally lethargic and sleeps more than usual, it might be a sign of diabetes. When glucose doesn't enter the cells, it goes straight into the bloodstream. Your dogs kidneys will attempt to filter the amount of glucose found in the bloodstream, resulting in increased amounts of urine. If your dog is urinating more frequently throughout the day or having accidents around the house, he might have diabetes. Because your dog is losing energy due to lack of glucose, he'll become extremely hungry to try and get the necessary energy for his body. However, because the body won't properly use the food, he'll continue to feel hungry no matter how much he eats. Your dog will also feel a constant thirst due to increased urine production. Overall, he'll be eating and drinking a lot more, and losing weight in the process. Thinning or duller fur can be a symptom of a number of illnesses, diabetes included. If your dog's hair is thinning, your should get him checked out immediately. Water will build up behind the lenses of your dog's eyes if his blood glucose levels remain untreated. This can cause the look of cloudy eyes. If your dog's eyes are cloudy, send him to the vet immediately. This problem can lead to cataracts and blindness. If your dog shows one or more of these symptoms, it's important that you take him to a vet immediately. Learn proper treatments, and take good care of your furry friend.